Educated cyclists know that they not only can (legally), but should (for safety) occupy an entire lane when conditions dictate. One of these conditions is when the lane is too narrow to safely share side-by-side. See more on the safety discussion at Where to ride on the road. Arizona law is quite strong and plain in this regard. Here is the relevant law, (I intentionally clipped the part about the cyclist’s speed, which is briefly treated later). §28-815. Riding on roadways… A. A person riding a bicycle…shall ride as close as practicable to the right-hand curb or edge of the roadway, except… 4. If the lane in which the person is operating the bicycle is too narrow for a bicycle and a vehicle to travel safely side by side within the lane. So this law creates a duty in part A for cyclists, but there are enumerated exceptions to this duty, the 4th one being the subject of this article. We are reminded that from time to time, cyclists are targeted by law enforcement for “taking the lane”. This sometimes takes the form of mis-guided paternalism — “you should always ride to the extreme right so you don’t get hit”. It also can take a an uglier tone of faux-paternalism, really just thinly-veiled automobile-superiority attitude bias against cyclists, the sub-text being “cyclists must always get out of the way of cars”. Below, transcribed from a trial’s full audio are illustrative statements by an un or mal-trained police officer; here is just one, indicating the officer’s idea of correct lane positioning, that bicyclists should and must ride so their right hand is actually over the curb, or even the sidewalk! “but not even as close as typically somebody would, where their right handlebar almost hangs over the curb or the sidewalk”. And disappointingly sometimes cyclists are found guilty (actually “responsible” is the correct term) by compliant lower courts. Happily, Arizona cyclists can point to not one but two (now three) relatively recent Superior Court decisions which reversed on appeal these wrongful convictions. The first case, Arizona V. Goren, occurred in Tempe (Maricopa County). In the second case the rider was riding two abreast, but that isn’t relevant to the case; Arizona V. Piscopo, Pima County (see more generally at Two Abreastness. Also see the case at TBL, the blog of the lawyer who represented Piscopo). I would encourage everyone to read both of these decisions because they are brief, well-written, and illustrative. For reasons excruciatingly detailed in Arizona’s FTR Law, for practical reasons of common methods of street design and construction, lanes (the curb lane, if multi-lane) are nearly always ‘narrow’. For legal purposes, of course, to be found responsible for a violation it’s necessary for the state (the police officer, or prosecutor) to prove the ‘slower than’ condition existed, as well as none of the exceptions, including the narrow lane exception, exits. (Everyone, including bicyclists, are innocent until proven responsible!). A ‘design’ cyclist on a common upright bicycle is generally accepted to be 2.5′ wide (see AASHTO Guide). Though of course some devices can be wider. This dimension includes no shy space either left or right of the cyclist. The relevant vehicle width is not the particular police officer’s vehicle, or the vehicle that happened to be behind you. It is any vehicle that may be legally upon the road where the alleged violation occurred. For ‘busy’ roads, this is nearly always the largest trucks and buses allowed on any road, which with mirrors can be 10 feet or more wide. This is as specified in the law, see grammar lesson. Shoulder use (the region to the right of an edge line) is never required by 28-815A (because a shoulder is not part of the roadway). In other words, a cyclists cannot violate 28-815A due to the existence of a shoulder. The definition of whether any particular lane is “too narrow to share…” can be a gray area; it is, e.g. not (directly) specified in feet and inches by the law. In Goren, Officer Ross Thompson (the superior court document refer to him, apparently incorrectly, as R. Johnson) maintained that 12’10” (his measurement) was more than ample. He was, however, not aware of the concept of usable space; and thus incorrectly counted the gutter as lane width. In the end, the court accepted that the defendant’s measurement approximately 11′ usable width was both accurate and clearly narrow. Much the same conclusion was reached in Piscopo: “credibility was not at issue and the salient evidence — the dimensions at play — appear undisputed”, the dimension according to the defendant were “no more than 11 feet wide”. In general, 4.2 m (14 feet) of usable lane width is the recommended width for shared use in a wide curb lane…(the gutter pan should not be included as usable width). Chapter 14 of the ITE Traffic Control Devices Handbook, 2nd Edition. You can play with the dimensions, e.g. if you allow a minimum of 1 foot both to the left of the (8′) motor vehicle, and the right of the (2′) cyclist, plus mandated 3′ between the cyclist and motor vehicle — you come up with something akin to the 14′ mentioned by AAHSTO and ITE [iamtraffic.com has a very handy interactive tool]. Many vehicles are less than 8′, but not by much — and don’t forget to include the mirror width which is commonly not included in specifications. Traffic engineer and cyclist Richard Moeur has created an elegant schematic drawing divvying up the 14′, minimum, of usable space here. (archived copy) (and Note Well: this diagram shows a “typical” vehicle, not a large vehicle like a bus or truck that is significantly wider– see some comments below from Wayne Pein referring to the zombie myth). More similar diagrams from humantransport.org. Nota Bene: some or even many motor vehicles are wider than 8′; common buses and trucks are 8.5′ wide plus the width of their mirrors which protrude from both sides typically up to 1 foot, for a total width of 10.5 feet. It is therefore the case that 14′ is not necessarily wide enough to share. Also see How Wide should a Wide Curb Lane Be?, by Wayne Pein, which provides a literature review, and takes into account other factors such as wind blast and the effect of speed limits and expected truck traffic. For maximum allowed vehicle widths, see width-of-vehicles. The short answer is in AZ, vehicles around 10 feet (including mirror width) are allowed on most ‘busy’ roads. See comment at aashto-guide-for-the-development-of-bicycle-facilities for lots of links to illustrations; especially pertaining to dimensions of BLs and the travel lane they are adjacent to; it turns out that frequently the travel lane width is a limiting factor due to edge hazards and debris, not to mention doorzones when next to parking. There’s a wonderful animation at commuteorlando.com about correct lane positioning. 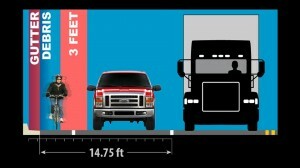 At left: Depiction of an ~ zero-clearance pass in a 12 foot lane; and why even a 14 foot lane is unsuitable for sharing. 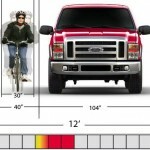 The Ford F-250 is depicted in this graphic — which is accurately scaled — is 104.9″ wide w/standard mirrors. The Ford F-150 is either one of, if not the most popular model of automobile in the US. There are many millions of them, and many millions more equivalent products from GM and other manufacturers, and many many millions more similarly sized (so-called “full sized”) SUVs. The graphic is from iamtraffic.org. Dimensions retrieved 8/20/2015: F-250, F-150. Here is a document about Accommodating Bicyclists Through Temporary Traffic Control (TTC) Zones i.e. work/construction zones; brought to you by the Temporary Traffic Control Technical Committee (TTCTC) in association with Bicycle Technical Committee (BTC) of the National Comittee on Uniform Traffic Control Devices (NCUTCD). The bicycle technical committee of the has proposed changes to the MUTCD which document a lane narrower than 14ft as too narrow to be safely shared with another vehicle, side by side, within the lane. Neither of the aforementioned cases dealt with whether or not the cyclists were “at less than the normal speed of traffic”. In a nutshell: some courts (but none in Arizona, that i know of) have held that normal means normal for a bicycle. See e.g. State V Patrick , which references the Selz decision; both out of Ohio. This was not at issue in any of these cases, for some more general discussion of impeding see Bicycles are not Motor Vehicles and Why it Matters. In short the general impeding rule, 28-704A only applies to motorists; and the far more restrictive (applies only on two-lane highways, only applies when five or more vehicles are impeded, and only applies when the vehicles being impeded cannot pass for some reason) 704C does apply, but as a practical matter because of all the restrictions rarely applies to anybody. See laws here. There is a memo from Lt. K. Woolridge date March 5, 2009 which states the (Pima) county attoney’s position particularly with respect to riding two-abreast. Further inquiries are directed to Seargent Copfer. There are a number of guides for pro se / pro per appellants on the Arizona Supreme Court website. Delivery trucks parked in the bike lane on a residential street during “No Parking in the Bike Lane” hours almost always compel me to take the lane. They fill not only the bike lane but stick out into the street. I would prefer that they not park in the bike lane during the “No Parking in the Bike Lane” hours, but, for example this morning, with a water delivery truck doing that, I glanced behind me, signaled, and took the lane. A car also in my lane came up behind me about the same time I was riding past the truck, allowed me time to reenter the bike lane, then passed me. I took the lane not only to get around the truck safely, but also because there was oncoming traffic in the opposite lane, and saw no alternative. Any thoughts on this situation? Should I have done differently, generally speaking? sounds like you and the driver did exactly the right thing. Can you pass this onto Biketempe.org Please or else I will. At some point the argument needs to be made that the only purpose these bike-specific laws serve is to allow biased law enforcement officers (and lower court judges) to misinterpret them per their anti-bike bias, and wrongfully charge and fine bicyclists. Many states do not have bike-specific laws (Pennsylvania and North Carolina are two examples), and there is no chaos or mayhem as a result. The laws that govern the behavior of drivers of slow moving vehicles are appropriate and sufficient for governing the behavior drivers of bicycles when they are moving slower than other traffic. To eliminate anti-bike bias in law enforcement, how about starting a campaign to abolish traffic laws that restrict the behavior of bicyclists specifically? And no, we don’t need to have bike-specific law to give us the right to “take the lane” – all drivers, including those operating slow moving vehicles, have the right to control marked lanes – and so would bicyclists if there was no bike-specific law calling for “far right as practicable” (FRAP) behavior in marked lanes. FRAP should only apply to bicyclists on roads without marked lanes, as it does to all drivers of slow-moving vehicles, which it would if there were no bike-specific restrictive laws. Here is a case that was won in Columbus, OH. I noticed that the lane in question there was 11’3″ — all three of the Arizona cases detailed above involve lanes with ~ 11′ of usable width. Slow moving vehicles are a target of the majority most places they are not rare. Serge is right; but that principle should extend to other road users uniformly. A Segway may be a toy vehicle but the way it operates on the road makes it a similar problem to pass as a cyclist or a couple in a golf cart. trucks. Lane width and lateral clearance to bicyclists must account for the inevitability of trucks with mirrors that make their width 10′. This probably works pretty well in the case where there is no shoulder — i.e. a typical “city street”. I HATE 12′ lanes because they are at the same time too narrow to safely share; but at the same time are commonly perceived by drivers (and presumably this police officer) as wide enough to share. 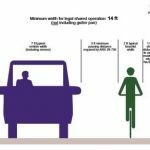 here is a great to-scale graphical depiction of 12 foot lanes and a normal vehicle (a regular pickup or suv) passing a cyclist riding at the very right hand edge: only 1.7 foot of passing clearance! Phoenix Traffic Court – two tickets dismissed (presumably an 815A and a 704A). Harassed by phoenix pd operating bicycle in travel lane of n. 24th st. Entered a copy of “Street smarts” into the record. If you find yourself as a defendant in a take-the-lane sort of case, you will almost certainly want to offer some reference material into evidence; such as “Arizona Street Smarts” (though do get a copy of the printed booklet). Note that the “rules of evidence” DO NOT apply in civil traffic cases, so you should have no trouble having the court admit them. azcourts.gov/rules then “current rules” then scan for and click on “Rules of Procedure in Civil Traffic and Civil Boating Violation Cases” then expand to individual rule numbers. I finally listened to the trial audio; here’s some notes, for my own reference if nothing else. It seems common for PD/FD to claim, or have to stop themselves from claiming, that traffic was “stopped” (here, it was “COMPLETELY IMPEDING”), rather than proceeding at a reduced rate of 10-20MPH. In this case, the officer testifies multiple times that passing traffic was moving “abruptly into the median lane” (should probably be lane#1). He also seems to advocate (in addition to sidewalk riding), a “partial lane change” passing maneuver. Although that’s hypothetically fine, it’s done poorly more often than not. Encouraging a full lane change is quite intentional. There’s the usual fear of “hit from behind”, but at least in this case, it’s explicit rather than unstated. Despite being employed by Tempe PD for thirteen years, and on the “bike squad” for 2.5 years, he seems to think it’s acceptable to require a bicyclist to hug the curb. It seems to me he was unfamiliar with the so-called “3 foot” passing distance law. TRYING TO GET AROUND HIM. THIS IS ALLOWING HIM TO RIDE WITH HIS HANDLEBAR RIGHT UP AGAINST THE SIDEWALK AREA, and STILL ALLOWING A VEHICLE TO PASS as you can see by the diagram below, that a typical vehicle can fit in that lane, alongside, and in my opinion, it’s much more safer to be on the right in that TRAFFIC WILL GENERALLY, TEMPORARILY, OCCUPY A VERY SMALL PORTION OF THE MEDIAN LANE AS THEY GO AROUND THE BICYCLE FOR A MUCH LESS PERIOD OF TIME AND IT DOESN’T CAUSE NEAR A HAZARD. In this particular situation, as I was speaking to Mr Goren, in fact, numerous bicycles passed us, going southbound, and, in every instance, THEY WERE ALL ON THE SIDEWALK. AND HIS ARGUMENT AS TO WHY HE WASN’T RIDING ON THE SIDEWALK, is that he was riding at approximately 20 MPH and didn’t feel it was safe to do so on the sidewalk, and I agreed with him that it probably wasn’t safe to ride 20 MPH on the sidewalk, BUT MAYBE HE SHOULD NOT RIDE AS QUICKLY. BUT AT LEAST HE WOULDN’T BE GETTING HIT FROM BEHIND, OR CAUSING A MAJOR HAZARD ON THE ROADWAY. THIS WAS CAUSING MORE OF A HAZARD THAN .. to have him being on the right side of the road OR BETTER YET THE SIDEWALK. … Based upon the width of his bicycle, I mean, he’s got his handlebars 1 foot off the edge of the road, well that puts, his bike is some 40 inches wide. That puts him another 2ft into the lane, so you’re talking over 3ft from the curb, WHICH ISN’T NECESSARY ON THE BICYCLE. Your handlebars are not een close to the roadway, they don’t need to be a certain distance off the curbline. original testimony, would only be occupying the median lane for a fraction of the period of time as opposed to having to completely make a lane change and go around the bicyclist. [In the end, the court accepted that the defendant’s measurement approximately 11′ usable width was both accurate and clearly narrow]. Well now, the median lanes based on the 3ft passage, THEY need to move to the far edge of their own lane in order to give him the 3ft HE’S INDICATING THAT HE NEEDS of safety. WHAT I WAS GETTING AT IN THIS WHOLE SITUATION IS: I’VE OBSERVED BIKES. I’VE BEEN WORKING IN TEMPE FOR 13 YEARS AS A POLICE OFFICER. I’VE RIDDEN A BIKE FOR A NUMBER OF YEARS. I MEAN I’M NOT UNFAMILIAR WITH BIKE RIDING. more dangerous than riding as the law state’s he’s supposed to, on the right side of the roadway. Almost every other instance I’ve seen in Tempe of bicyclists, they generally ride to the right side of the road or in many cases ride on the sidewalk, as TEMPE HAS VERY WIDE SIDEWALKS, I WOULD IMAGINE FOR THAT PURPOSE, but I don’t know that for sure. in July 2014 Ron Lacy won on appeal in CA. He was cited with CA’s AFRAP law. F.b. thread about the appeal; along with the full audio of the appeal hearing — in CA, unlike AZ, apparently traffic appeals are oral. This case involves a dispute about (not) riding in a DZBL (door zone bike lane); and also interestingly included assertions about two-abreast because an unaffiliated rider was riding abreast of Ron to his right, ie. in the DZBL; the state made various arguments, rejected by the appeals judge that riding two-abreast was evidence he was defacto not AFRAP because of that. I think iamtraffic.org has the full rundown so read that first. Richard Masoner has a rundown on the case at cyclelicio.us. Among the oddities: the town claimed Damon was violating federal wiretapping laws by using a helmet cam. The 54 page August 2013 federal judge’s ruling is somewhat mixed. Though in 12/2013, the town came to an agreement with Damon to pay $27,000 of his legal costs; so that’s certainly a win. Crazy things traffic court judges do: the AZ 3-foot law clearly states that when a “motor vehicle” is passing a bicycle, yaddie yadda. It places no duty on the bicyclist. Nevertheless, the cyclist (Goren, above) was found responsible for violation our FTR law for riding in the left wheel track of a narrow lane. The judge said the cyclist owed a duty to the drivers in the next lane over to not ride that far to the left, due to the three foot law(!). It was reversed on appeal; but for goodness sakes, how often do these things get a sensible appeal result?? These sorts of appeals do not create precedent, but it’s gratifying to see a correct result, nonetheless, especially since the cyclist was wrongly found responsible in traffic court. Police wrongly ticketed a cyclist for violating FTR; prosecutor motioned to dismiss the charge. It’s worth noting this prosecutor was initially mis-informed about the law but upon reading it agreed the police should not have cited; the exact opposite of what happens in Flagstaff, AZ, See remarks at trial by assistant City Attorney Brown.